Hi everybody! I got my new FitBit Charge HR yesterday morning and couldn't wait to get it out of the box and see how it looked and how it worked. I thought I'd share my first impressions with you. 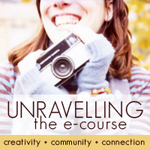 So, those of you that know me, know that I'm a gadget girl. These last few months I've also been working super hard at healthy eating and getting plenty of exercise. One of the things I've realized I wanted was a heart rate monitor. I've had a Fitbit Flex ever since they came out after killing not one, but two Fitbit One's with water/moisture damage. I actually liked the One a little better than the Flex since the One recorded stairs climbed and in my opinion did a little better job tracking sleep. That said, my Flex has been a durable power horse and using it has helped me hit my goal of 10,000 steps many days for the past couple of months. 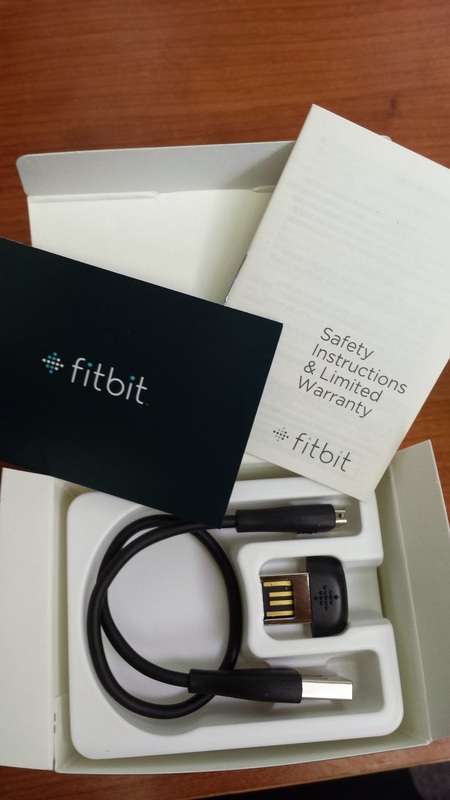 However, when Fitbit announced they were adding a line of wearables that included Heart Rate monitoring I knew that would be my Christmas present to myself. Officially, the Charge HR isn't available yet but I get on email on Sunday inviting me to order one early and get it really quickly. Of course - I took them up on the offer and after a little weather induced delay for FedEx, the Charge HR arrived yesterday morning. It came packaged as you see above and the "bit" itself is on a little plastic stand. The first difference I noticed after taking it out of the box was the change in the format on the wristband. 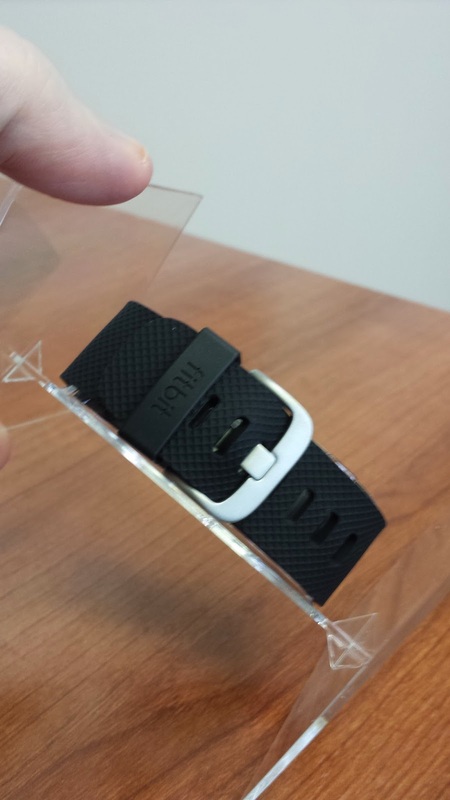 The flex has two little plastic prongs that you push into holes on the band. I always thought that looked a little stupid, but it was comfortable and the band didn't flop around. The Charge HR has a much more traditional watch band style. I have some more thoughts on the band and on sizing I'll share below. Also in the box is the charging cable and the USB wireless sync gizmo (yes - that's the technical term) that you put in your computer to let it sync. The charging cable is actually one of the things I am most excited about. If the Charge is like my Flex, it will need to charge for a couple of hours once a week. The way the Flex (my current fits in the charger has never been tight in any way and a couple of times I've put it on the charger before going to bed and come out the next morning to a dead Fitbit (womp, womp). 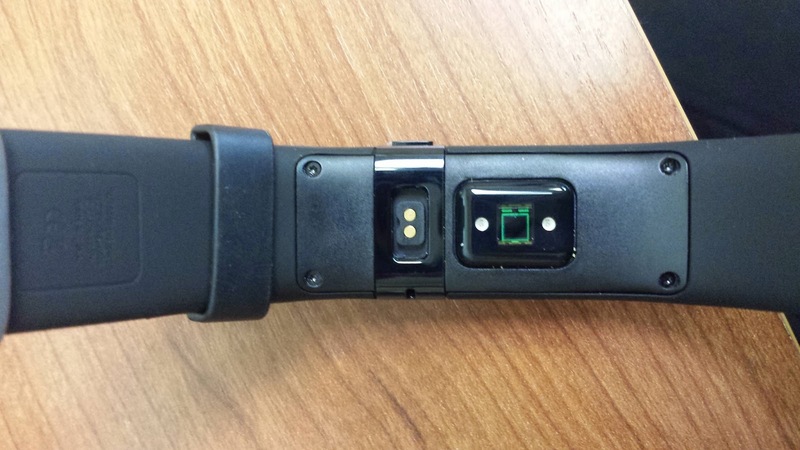 The Charge HR has a click in charger that actually locks tightly into the back of the Fitbit so - way to go Fitbit on fixing that design issue! 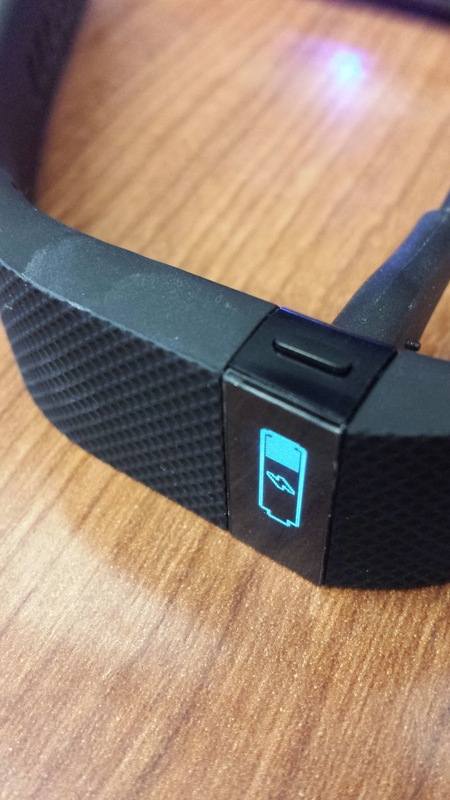 The charging cable plugs into that area with the two little dots close together on the back of the wristband. And you can see a little read out on the front showing you that it's charging! Honestly - this is the very best part for me because charging my Flex has become far more stressful than recharging the battery on a device should be - hence my excitement. If you have a Fitbit account already you have to set up this Fitbit with your account - or if you don't have a Fitbit yet you create your account. 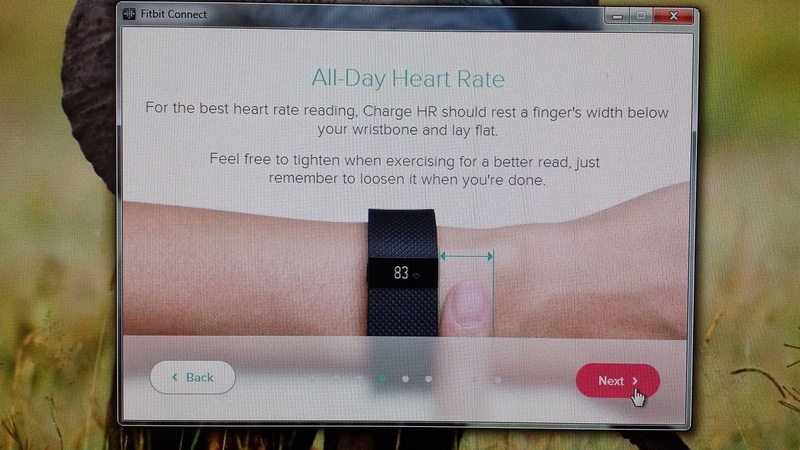 It's simple and easy, but there was a note in the Fitbit Charge HR setup that I wish I would have known about before I ordered - and that's where you're supposed to wear the Fitbit - which is actually about a finger width back from your wrist bone (see the photo below for the diagram that comes up on the screen during setup). My wrist is right at 6" at the wrist bone - which is in the sweet spot that is covered by both the small size band and the large size band. If I'd known about where it was supposed to be worn (which is a little wider on me), I might have opted for the larger band. That said, I've got more weight to lose so hopefully this will just get more comfortable and it's not uncomfortable to wear now - there just isn't much slack in it. Okay, so we unpacked it, gave it a little go juice, set it up with our Fitbit account - now we get to use it. I shot a quick little video to show you how it works - it's my first ever video product review. I'll put some text below to tell you what the different features are in case you can't listen to the video at work and - of course - I'll give a little more detail about some of them. The Heart Rate takes about a half second to register each time that you activate it. Once during my workout this morning (I'll talk about workout mode below) it actually didn't show my heart rate so I'll have to see if that trend continues. 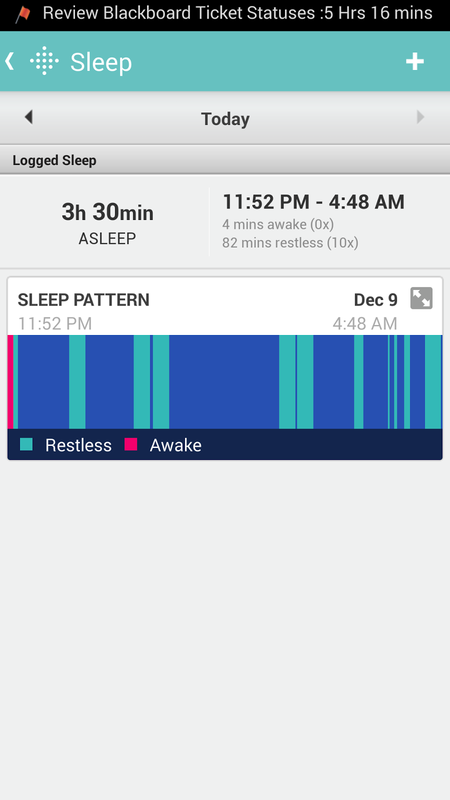 Sleep also gets recorded in the app (or on the web site) just like normal. This was my sleep graph from last night. One last note on sleep - while I was sitting here writing this - my Fitbit was just laying on my desk (from post video filming) and it logged that time as sleep - so there are some bugs in that feature. I'm guessing it's going to look like I take a nap every day about this time since I'll remove the Fitbit to shower. So...perhaps more work to do there for their designers and engineers. Personally, I'm so excited to have stairs climbed back again! Seriously - I'm shooting for 20 flights today! 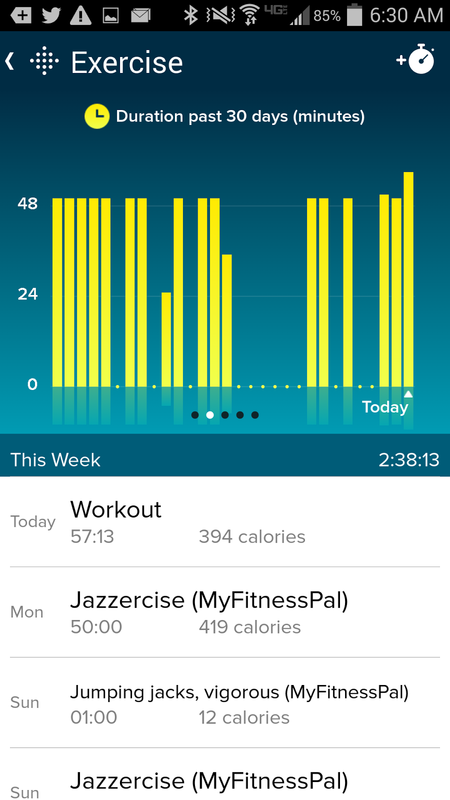 I heard today (at Jazzercise this morning since that's the only place I've been so early today) that you burn 15 calories every time you walk up a flight of stairs. Hi - my name is Kara - I will climb stairs for chocolate! I didn't realize just how much I missed having that feature until I got it back. 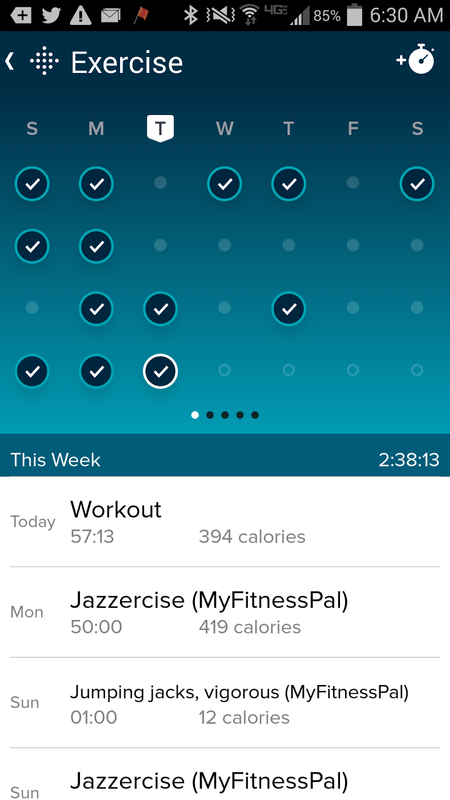 Let's talk about workout mode for a few minutes which is also quite awesome - and made me actually notice all the info hidden about exercise in the app. I used it this morning in my Jazzercise class. To activate workout mode on the Charge HR, just hold in the little button for three seconds until a little clock appears. When you finish your workout just hold it in again for three seconds until the little finish line flag appears. During the workout you only have to click once to get elapsed time and a second time to get Heart Rate. I got really comfortable just double clicking the little button this morning to go right to heart rate. At the end of the workout I checked the Exercise area of the app. Here's what you get. The first screen is the calendar screen showing all your workouts. You can see I've been recording my classes using the default Jazzercise in MyFitnessPal but today's workout recorded automatically from the Charge HR! (And never mind what happened to my workouts during Thanksgiving week - ugh! I did work out last Friday though so I'll have to figure out why that's not appearing. Notice the five little dots under the calendar - that means there are more screens so a quick swipe to the left gives you workout duration by day. 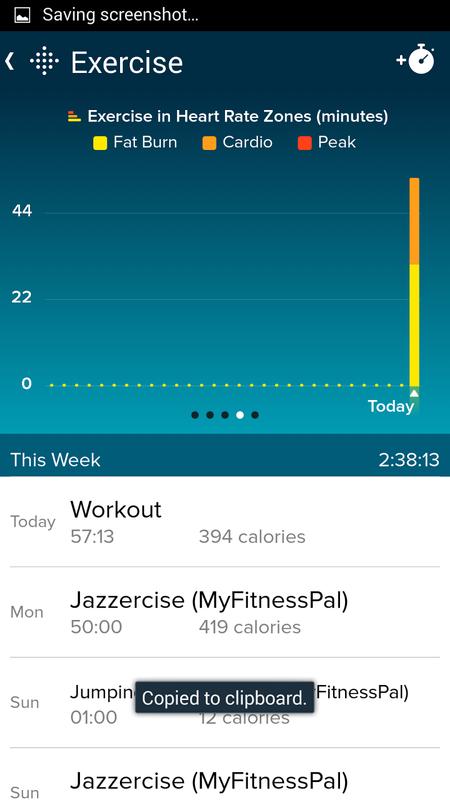 The next swipe over gives you distance by day - obviously doing Jazzercise I wasn't logging this and don't know that this one is particularly useful for me. This is a good place to point out the little stop watch icon in the upper right corner. I'll be honest - I had never clicked over to the Exercise graphs before today so I don't know if this has always been there and I just didn't realize it or if the app has updated recently since they've come out with these new devices. Anyway, in the exercise graphs there is another "hidden" feature of the app. 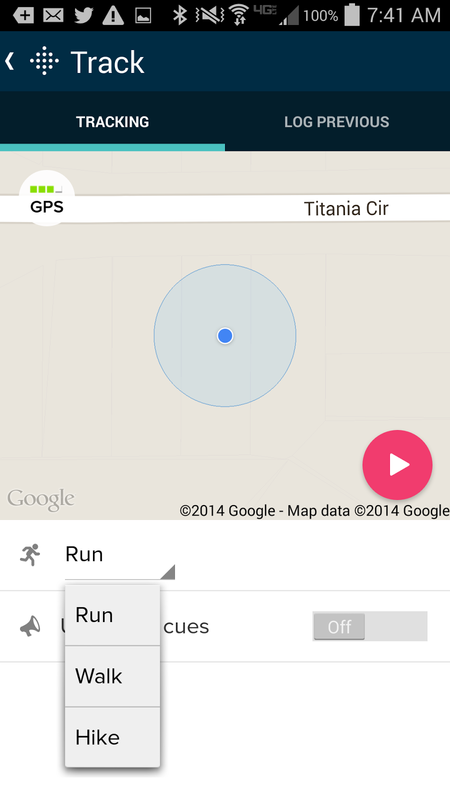 Tapping the stopwatch icon takes you into a route tracker! Here's a quick screen grab of that. Notice that you can choose between run, walk, or hike. There are also audio cues. I've used RunKeeper before when I'm doing a 5K but may have to try this one out the next time to see how it works. Going back to our exercise screens - because we've got two more (!!!) - and they saved the best for last (okay - really for fourth because this one is the one I'm most excited about). This one shows you exercise by Heart Rate Zone and total minutes in each zone by day. I've not dug into all the best rates for this and what's good and what's great, etc - but I know this is super useful and I'm excited to see this. I also apparently need to push myself a little harder and get my heart rate into that peak zone a bit. The last screen is calories burned by day. I'll be interested to see what this pattern looks like after a consistent month of classes because I know the days I think I work harder in class (and the instructors that push you harder) but it will be interesting to see if that's really true. 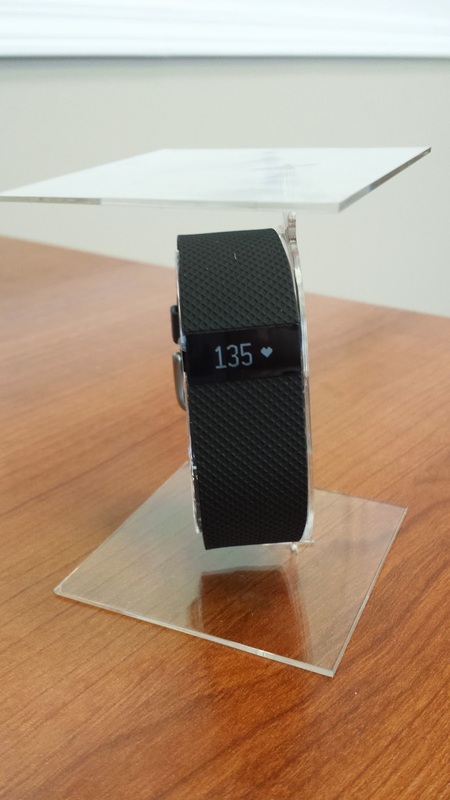 So, there you have it - the Fitbit Charge HR! There are also use and care tips that you get a link to when you do the set up. I did switch it to my other arm to sleep last night and will probably keep doing that. It is quite an investment so do make sure you read these and take good care of your device if you choose to buy one. There is one other feature which I didn't demo or grab a picture of but I have tested it once and it does work - and in fact all three of the new Fitbits - the Charge, the Charge HR (the one I got) and the Surge have this feature - and that's caller ID if you sync it with your phone. I wasn't sure I cared about this feature but my phone is always on either vibrate or silent and if it's in my bag when I'm shopping or running errands this may come in handy as the wristband vibrates and displays the name of the caller. I'll put this one in the heated seats category. I didn't think I needed it until I got it - now that I have it I'll probably never be able to go back. Darn you Fitbit! 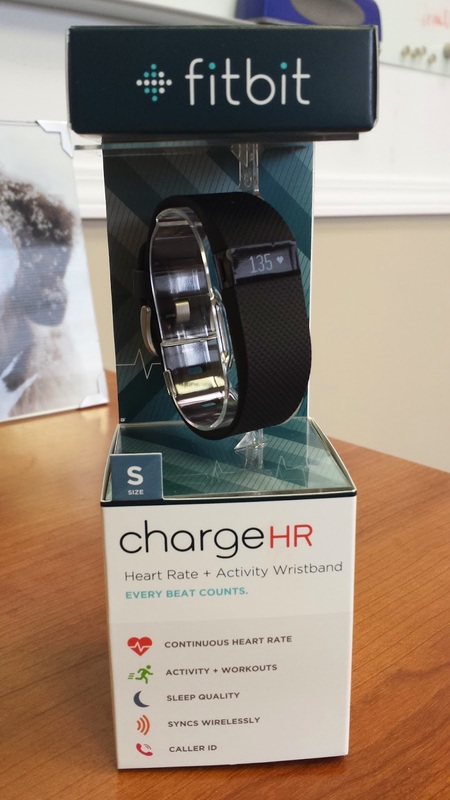 The Charge HR's aren't available to everyone yet but you can sign up on Fitbit's web site to get notified when they are available. They have the Charge available now as well as the Flex , One , and Zip . 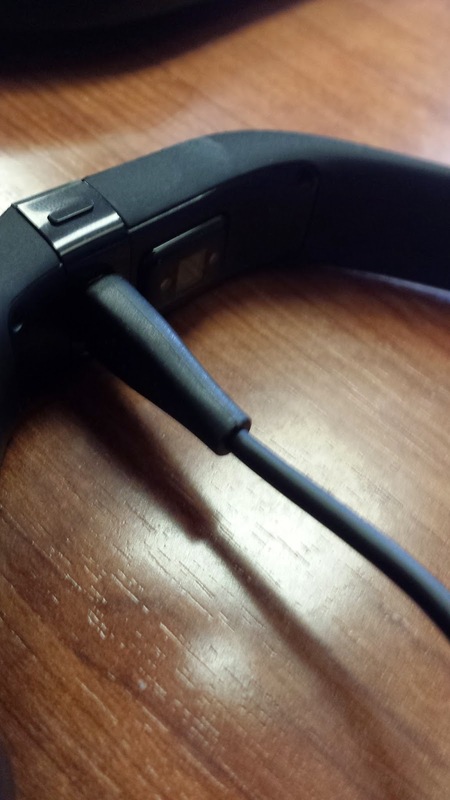 If you want Heart Rate monitoring though - wait for the Charge HR. One last note - I'm doing Cathy Zielske's awesome class Move More, Eat Well Jumpstart over at Big Picture Classes again in January. This is my fourth time through one of Cathy's Move More, Eat Well classes and I can honestly tell you that for me - that has been the secret sauce to finally getting my act together with health and fitness (well that and accountability partners). I have a post planned for later this month to talk about my progress, but I am amazed at how deflated people are when they ask me what I'm doing to get fit and I say moving more and eating well - that is the magic bullet - there isn't a pill or something else that will do it - and I think that depresses people. Anyway...that's for another post...back to Cathy's class. The class mixes a bit of scrapbooking with a huge dose of inspiration and encouragement from Cathy - and honestly - I've never completed the album projects but I always get more out of this class than any other I've taken at BPC so I highly recommend it. There is an awesome private Facebook group as well that's already providing loads of encouragement to get through the holidays without giving up all these good habits. 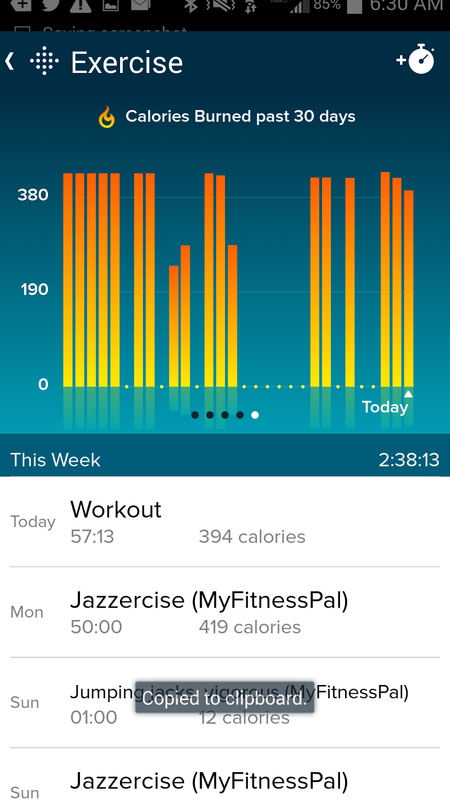 Do you use a Fitness tracker? Which one? Share in the comments what you think about these cool little gadgets - is it overkill or access to good data that helps you get even healthier? 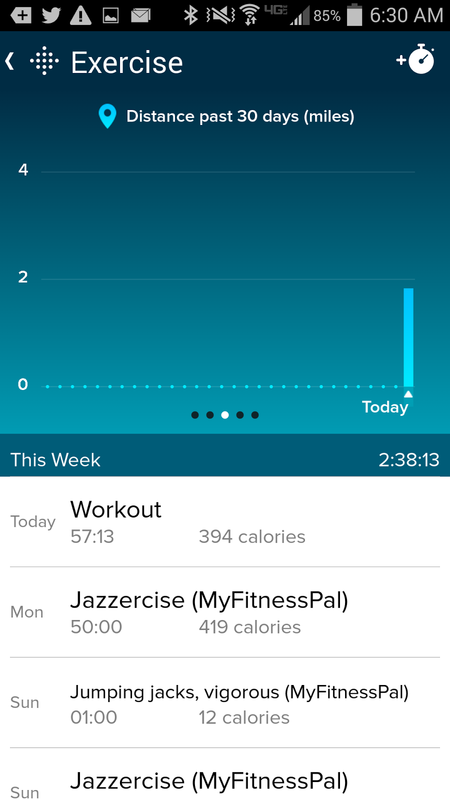 I randomly stumbled on your blog when I was googling fitbit charge hr reviews! thank you (seriously) for being so detailed; i definitely look forward to getting one myself! !